Have you updated your copy of Windows and received the "This copy of Windows is not genuine" notification. Have you ever wondered how to get rid of it? The Windows Genuine Advantage notification checks if you have a genuine copy of Windows registered to that computer. It allows you to update your computer with the Windows updates. If you have installed it, and you do not have a genuine copy of Windows XP installed, then you may notice an icon at the bottom of your window before you Login. It will make you wait three seconds before allowing you to login. JUST OPEAN START THEN CLICK RUN.Type "regedit"(without quotes) and press enter. 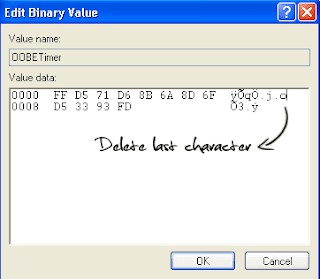 u'll find "OOBETimer" in the right side..
Search for WgaTray.exe and Delete it. C:\Windows\System32\dllcache\ and delete WgaTray.exe here also. Next you have to modify your registry. Press the Start Button > Run and type regedit and then press enter. Go to HKEY_LOCAL_MACHINE\SOFTWARE\Microsoft\Windows NT\CurrentVersion\Winlogon\Notify and delete the WGALOGON folder. That's all you have to do, now you are WGA free. Just make sure you don't automatically install the WGA update again. Restart your computer to see if you did it correctly. The WGA logo should not appear on your login screen. DISCLAIMER: We do not condone having pirated copies of Windows on your computer. You should have one CAL per computer. This is for educational purposes only. It seems OK. No more notifications! Excellent work, thanks a lot! Thanks, but on my pc regedit is not working. what should I do now? Can you tell me how to register a genuine Microsoft office , in a similar way , instead of contacting microsoft by phone etc. MY msoobe FOLDER DOES NOT OPEN SUM 1 TELL ME WAT TO DO !!!!!!!!!!!!!!!!!!!!!!!! !